A quick review for Globe DSL and Broadband Plans Review 2017 and things you should know about this 2017 Globe broadband and DSL update. The Philippines ranked 176th out of 202 countries with an average download speed of 3.64 megabit per second (mbps), way below the average broadband speed of 23.3 mbps. This was the second slowest in Asia, next to cellar-dweller Afghanistan with 2.52 mbps. Despite being one of the slowest, Internet in the Philippines also emerged as one of the most expensive with an average value of $18.19 per mbps, exceeding the average global cost of $5.21. The country also ranked 59th in the relative cost of broadband subscription, which was set at $31.55. In the most European countries is DSL Speed until 2-3 Mbps free - nobody would pay for "useless speed." PH has slowest internet in Southeast Asia. Thailand has an average speed of 17.92 Mbps (48th worldwide), Vietnam has 13 Mbps (61st), Cambodia has 5.74 Mbps (116th), Malaysia has 5.4 Mbps (122nd), Brunei has 5.3 Mbps (125th), Myanmar has 5.22 Mbps (127th), Laos has 4.33 Mbps (143rd), and Indonesia has 4.19 Mbps (148th). Philippines has an average speed of 3.54 Mbps (158th). If you are a current Globe Broadband subscriber, you have to call 730-1000 now! Last Friday, 19th of August, Globe launched their new and exciting broadband plans! This means that you can already subscribe to speeds of up to 10mbps for only P1299.00 per month with an increase on usage allocation, too. We are currently subscribed to their Plan 1599 which only includes a usage allocation of 50GB per month at a maximum speed of 5mbps. Now we can upgrade to a 15mbps plan with an allocation of 150GB per month at the same price. 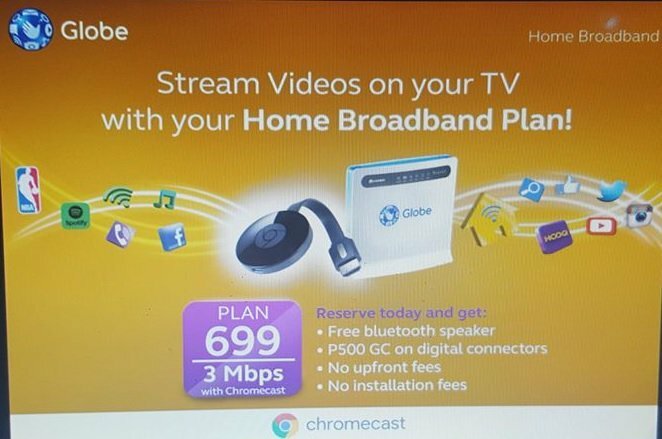 Globe has introduced a new DSL/Broadband plan for new subscriber and contract renewals. The main difference of this new plan from the old plan is the data cap. 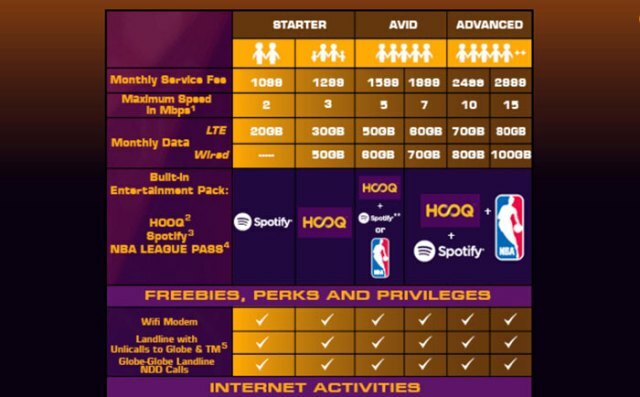 The old plan has a daily caps while the new plan would use of the monthly data caps. UPDATE: Globe issued Press Statement that existing subscribers will not be affected by the changes introduced in their broadband plans. Starter users can choose between Plan 999, Plan 1099 or Plan 1299. Plan 999 can reach speeds of up to 2Mbps with 10GB monthly data cap, Plan 1099 can reach speeds of up to 1Mbps with 10GB monthly data cap, while Plan 1299 can reach speeds of up to 3Mbps with 15GB monthly data cap. Avid users can choose between Plans 1599 that comes with speeds of up to 5Mbps with 20GB monthly data cap, and Plan 1999 speeds of up to 7Mbps and 30GB monthly data cap. Advanced users have options of Plan 2499 with speeds of up to 10Mbps with 50GB monthly data cap, and Plan 2999 with speeds of 15Mbps and 70GB monthly data cap. On the other hand, Platinum users have Plan 3749(25Mbps, 100GB cap), Plan 4999(50Mbps, 150GB cap), Plan 6999(100Mbps, 350GB cap), and Plan 9999(150Mbps, 500GB cap). Now what will happen if you have reached your monthly data cap? Your speed will be throttled down to 64Kbps, in short almost useless? Or you may avail of a Volume Boost Add-on to restore you internet speed (for LTE subscriber only). It seems like data caps either daily or monthly will be prevalent in the coming years especially broadband internet access. What are your thoughts on Globe’s new plan schemes? To start with, I already have a PLDT DSL plan 1299 (2Mbps) and a Smartbro WIMAX plan 1299 (2Mbps). I have already relocated the Smartbro WiMAX on my brothers house for them to use. With regards to the PLDT DSL even though it’s speed is just 2Mpbs I am already contented with it and have to complains with regards to their service. So why another Internet connection, well to comply to one of the requirements of my freelance employer is a “fast” internet connection. Well “fast” means 15Mpbs connection, but since a 15Mbps connection is not yet available in my area I have to contend with Globes offering of 10Mbps and hope that my employer will agree to this compromise, while I wait for the chance to upgrade it to 15Mbps once globe rolled out their wired service in my area. Installation with regards to the Globe LTE DSL is quite fast. They were able to set me up within one day. Though the sim does lock up on the third day, but they have replaced it the following day. Speed is good my average speed is between 5Mbps-8Mbps, and I am able to get 10Mbps from time to time though I have to say that in order to get good speed you really need a good LTE signal, 3 bars in my case. It is all about the New Globe DSL and Broadband Plans Review 201, New Globe DSL and Broadband Plans Review 201 coverage as well as New Globe DSL and Broadband Plans Review 201 New Globe DSL and Broadband Plans Review 2017. I hope you guys enjoying this! 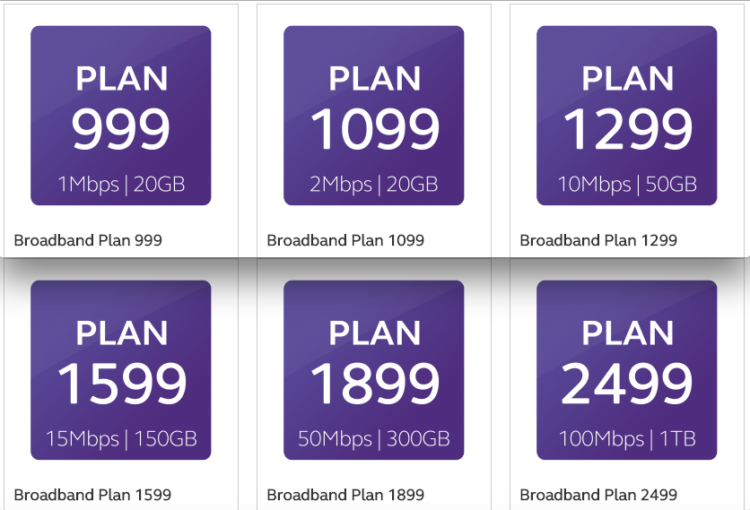 I've heard Globe have started rolling out new Home Broadband Plans (Plan 1299 for 10Mbps and Plan 1599 for 15Mbps). How can I upgrade my current Plan 1599 for 5mbps to those new plans? I got an offer from Globe Loyalty Department to upgrade my current (now old plan) plan from 3mbps @ 1299/month with 7GB per day data allowance to plan 15mbps @ 1599/month with 150GB per month data allowance. So far, I am delighted with my upgrade. I have asked them when is their estimated date to roll out these new plans but they cannot give me a definite answer. Globe has reached out to us and clarified that the information posted below are intended for the media during the event. Freebies such as ‘Free Installation’, ‘Free Bluetooth Speaker’, ‘500 Pesos GC on digital connectors’ found on the images are exclusive offers to the media. Globe will release new Home Broadband Plan offerings for regular consumers soon. Below are the two new Home Broadband Plans (LTE) we know so far. Both come with free Google Chromecast. What we don’t have as of the moment are the monthly data allowances and other perks. There’s also a Plan 999 but we’re yet to confirm the speed, but our guess is 5 Mbps. We’ll keep you guys posted as soon as we get more info. Last year I applied for Globe Philippines’s Tattoo Home Broadband DSL Plan 1599 with a 5Mbps download speed and around 1Mbps upload speed. It’s not a symmetric as expected but it’s probably one of the best broadband plans out there. 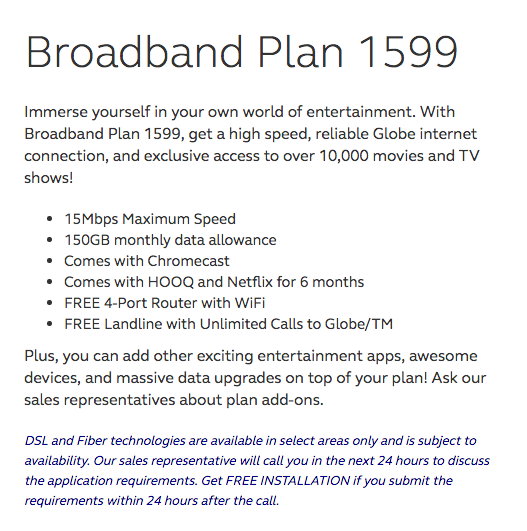 Read our Globe Tattoo Home Broadband Plan 1599 (wired or DSL) review to find out why. For a P1599 a month, the plan comes with a free landline and unlimited calls to Globe/TM. However, the wireless router + model wasn’t free and it cost Php 1k pesos on top of the billing (so there’s an added P333-ish for first 3 mos). So we know that this plan has no frills at all. The data allowance for my plan is 60GB a month (50GB for 4G LTE broadband wireless plan), which is already enough for browsing and streaming videos for a family of 4-5 members. Of course, this is without heavy movie downloads from torrent websites. Although, an up to 5 HD/720p movie downloads are okay as long as you monitor the data consumption. At our home in Bacolod, Negros Occidental we’re on PLDT Home DSL Plan at P1299 a month and we’ve been using it for a year. The speed is 2Mbps and it’s unlimited too. But what I didn’t like about PLDT is that disconnection and slowdown are more frequent. With Globe Plan 1599 here in Metro Manila, I only experienced one downtime since last year. That’s around 99% uptime if we are to put ideal efficiency rate. Promised speed is always at 4.8Mbps – 5Mbps download, which is great if you’re relying in your internet for working at home. What I also noticed after subscribing to Globe is their improved customer service compared to previous years (WiMax era). In fact, they’re now much better than PLDT in providing customer service. Although, PLDT last time addressed my application faster than Globe. It’s true that PLDT has more customers than Globe in select areas, but this is bad if you wanted to apply for PLDT. The number one reason is the availability of port. I canceled my PLDT application because our area where I’m renting my apartment doesn’t have a free port for a new line. Usually, you’ll have to wait for other customers to end their subscription and that’s the time PLDT could install your DSL line. And we don’t know if how many weeks or months it will happen. PLDT could install new facilities, but you will need to wait for more customers to apply in your area. Again there’s no guarantee on that. The issue is similar to Globe when I applied, but they really insisted and found a way to install a line despite the nearest telephone box is full. They reroute my planned line before installing it. And that’s why I’m really glad. PLDT, on the other hand, didn’t even care at giving me options such as a wireless ULTERA plan. PLDT still offers some better plans than Globe like the unlimited data (without speed throttling or slowdown) than the data consumable of Globe. But after discovering about Globe’s unlimited data even if it is a data-capped plan and better customer service, I think I will be choosing Tattoo Home for now. Highlighted Comments and Review: globe broadband 3mbps? internet reconnection 300, late payment 50.00 pra nmn kyo mga linta, hindi ako magbabayad sa USELESS SPEED 0.23 speedtest nasan ang speed dun? mapapamura ka mamumuti mata mo sa lagging, inyo na ang usad pagong na internet connection ay nakakahiya sa pagong, mas mabilis pa pla si pong pagong, nag renew yung monthly cap. Okay okay naman ang internet. FB, Youtube, LoL lang usually ginagawa. Di nagddl/ nood ng movie. April 6 (Wed) morning nawalan ng net, sinabi nagkaproblema sa connection. April 8 (Fri) evening naayos. April 9 nagmessage, PAUBOS NA RAW ANG 50 GB ALLOWANCE??? 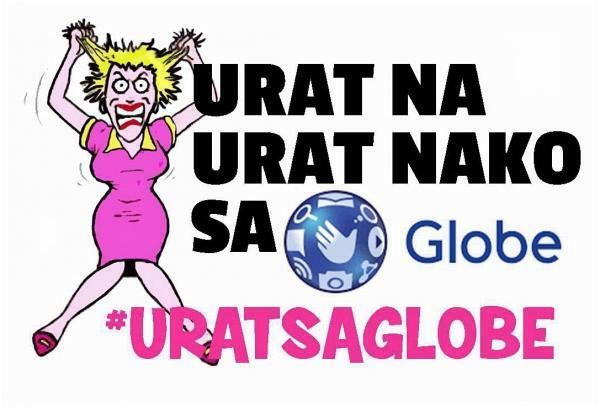 ANO 'TO, GLOBE, LOKOHAN??? SINO BA UMUUBOS NG 50 GB NAMIN, STAFF NIYO DYAN?? ?kaya ako magswitch na s pldt dsl pasalamt lng aq at meron slot dito s amin, kc wala kasinungalingan yung sinabi nila n unlimited at fair usage act, install sila ng install tapos alam nmn nilang mahina n, luge, Plan scheme or scam? 1299 lang dapat kami pero nagiging 1799 tapos sasabihin kaya daw mabagal internet connection kasi nag-exceed na daw sa 100 GB, may telephone na kasama pero hindi ka man lang i-notify kung paubos na ba limit mo kaya mapapaisip ka kung saan nila kinukuha 'yang GB na nagamit na "daw" tsk, I have 3mps speed plan the twist is i only receive 300 kbs? whats 3mps is it 300 kbs? 100 kbs is converted to 1mps? i look like an idiot right now cuz the last thing about this is 1000 kbs is 1mps.mag research knga, i convert mo sa google may converter sila. 1Megabits to Kilobytes hindi Kilobit ah. 1Mbps dapat 125KB/s yan 2Mbps 250KB/S kapag 3Mbps naman 375KB/s. ikaw kasi akala mo kapag sinabing 3mbps e 3000kbps tlga dl speed mo. Mag rereklamo ka na nga lang d mo pa alam yang basic na yan. Related things: Plan 999, Plan 1099 or Plan 1299. Plan 999, Plans 1599 that comes with speeds of up to 5Mbps with 20GB monthly data cap, and Plan 1999 speeds of up to 7Mbps and 30GB, Plan 2499 with speeds of up to 10Mbps with 50GB monthly data cap, and Plan 2999 with speeds of 15Mbps, Plan 3749(25Mbps, 100GB cap), Plan 4999(50Mbps, 150GB cap), Plan 6999(100Mbps, 350GB cap), and Plan 9999(150Mbps, 500GB cap) dals and broandband. Thank you for viewing update contents for New Globe DSL and Broadband Plans Review 201, if you like the post, you may share it via facebook, twitter or other social networking tool located at upper left of this page. If you want to make inquiries, reaction, recommendation or some thoughts to express, you may write it below in the comment section and till next time for the upcoming update from Globe DSL and broadband features.